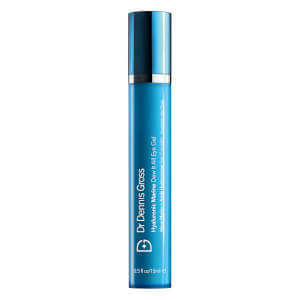 Correct and perfect your eye area with Dr Dennis Gross Skincare Hyaluronic Marine Dew It Right Eye Gel, a refreshing and hydrating formula for tired and delicate skin. Melting in effortlessly, the gel instantly soothes fatigued eyes whilst using Hyaluronic Acid to provide deep hydration for up to 72 hours. Japanese Green Caviar Algae works to smooth the appearance of dehydration lines, Caffeine reduces puffiness and optical diffusers brighten dark circles for a luminous boost. Tired eyes will be left looking radiant, healthy and wide awake.